View the Important Notice for TI Designs covering authorized use, intellectual property matters and disclaimers. 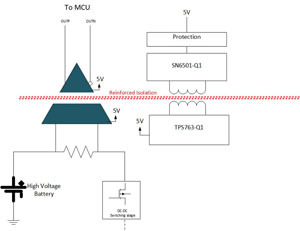 This reference design demonstrates high-side primary current sensing in DC/DC converter and onboard charger (OBC) applications for hybrid and electric vehicles. Using an isolated shunt approach for current sensing has several advantages, including high accuracy, linearity and robustness. However, the large input range of isolated amplifiers causes the shunt to experience high power dissipation. To solve this problem, this reference design utilizes a lower input range isolated amplifier, reducing power dissipation while maintaining the advantages of the shunt-based approach. Quickly understand overall system functionality. 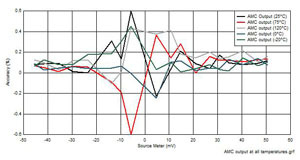 Get results faster with test and simulation data that's been verified. Download ready-to-use system files to speed your design process. Get Viewer. 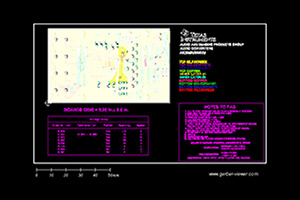 Order samples, get tools and find more information on the TI products in this reference design. Texas Instruments and Accelerated Designs, Inc. have collaborated together to provide TI customers with schematic symbols and PCB layout footprints for TI products. Step 1: Download and install the free download. Step 2: Download the Symbol and Footprint from the CAD.bxl file table. Step 3: Open the .bxl file with the Ultra Librarian software. Both PCB footprints and schematic symbols are available for download in a vendor neutral format, which can then be exported to the leading EDA CAD/CAE design tools using the Ultra Librarian Reader. The reader is available as a (free download.). The UL Reader is a subset of the Ultra Librarian toolset that can generate, import, and export components and their attributes in virtually any EDA CAD/CAE format. Search our extensive online knowledge base where millions of technical questions and answers are available 24/7. Content is provided &apos;AS IS&apos; by the respective TI and Community contributors and does not constitute TI specifications. If you have questions about quality, packaging, or ordering TI products visit our Support page.